Hai-Lu You, a researcher from the Insitute of Geology in Beijing, was part of the team that discovered the fossil. He told BBC News he was "very excited" when he realised the significance of what his team had found. He described the filaments seen on the body of the new dinosaur, which the team has named Tianyulong confuciusi , as "protofeathers" - the precursors of modern feathers. "Their function was probably display, as well as to keep the body warm" he said. Dr You's team noticed that the filaments on the base of their dinosaur's tail were extremely long. These, they suggest, might have evolved for show, and may even have been coloured. "The world of dinosaurs would [have been] more colourful and active than we previously imagined," he said. Dinosaurs can be categorised into two large families - the Saurischia and the Ornithischia. 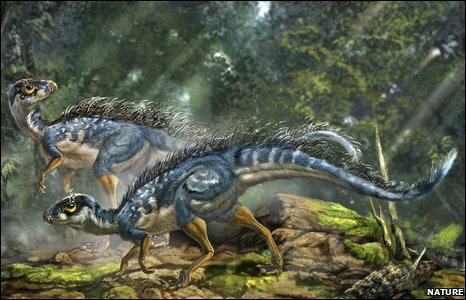 The Saurischia family includes the theropods - thought to be the ancestors of modern birds. Fossils of these dinosaurs have revealed that some of them were feathered. But the newly-discovered dinosaur is a member of the Ornithischia group - all previously thought to have reptilian scales. Professor Lawrence Witmer, a paleontologist from Ohio University, says this "really muddies the waters" of what researchers know about the origin of feathers. It suggests that their origin might go right back to the earliest ancestors of all dinosaurs - more than 200 million years ago. "The bad news is that something we thought was neatly wrapped up is now not so neat," said Professor Witmer. "We now need to rethink what the coat of the ancestral dinosaurs actually was." He added: "But the good news is that we can now look at existing evidence with new eyes - going back to old fossils and asking if there is evidence of any of these filaments." The team, who named the dinosaur after the Tianyu Museum of Nature, where the fossil is housed, also dedicated part of its name to the philosopher Confucius to reflect how it has changed the modern view of dinosaurs. "Maybe all dinosaurs, even the predominantly scaled ones, had fuzzy parts," added Professor Witmer. "And if they were covered in a fuzzy coat, what does that tell us about their physiology? Perhaps they were warm-blooded. "We now need to think completely differently about the evidence we already have."